The Steirischer Herbst is the oldest interdisciplinary arts festival in Europe. Taking place in the picturesque city of Graz, it’s famous for innovation and controversy. 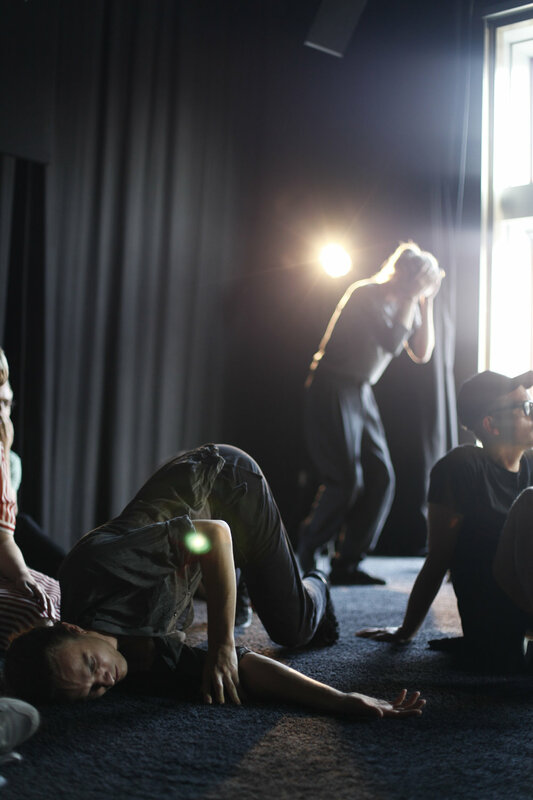 The 2018 director Ekaterina Degot brought the main project ‘Volksfronten’, curated by the team of Steirischer Herbst to the city. 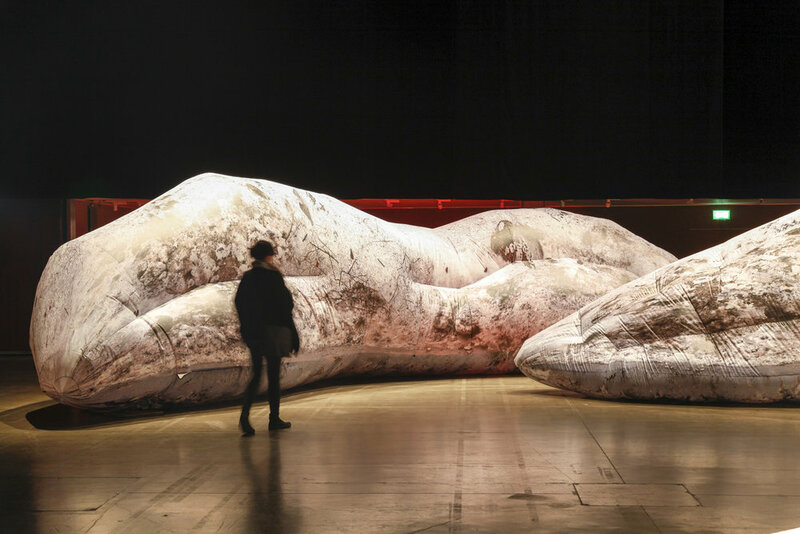 Alongside a team of photographers and video producers, our job was to capture the temporary installations and events, providing international media with images to illustrate their coverage of the festival. About the ‘Volksfronten’, Degot writes: “In our current times, all over the world, the state propaganda machine, rising xenophobia, anti-refugee politics, and the complicity of the ‘entitled’ population in those structures that maintain it’s privileges offer an astonishing and alarming deja-vu of the 1930s…..But there does not seem to be any united front standing up against this encroaching fascism. Instead we find ourselves fighting on many smaller fronts over myriad, mostly cultural issues. 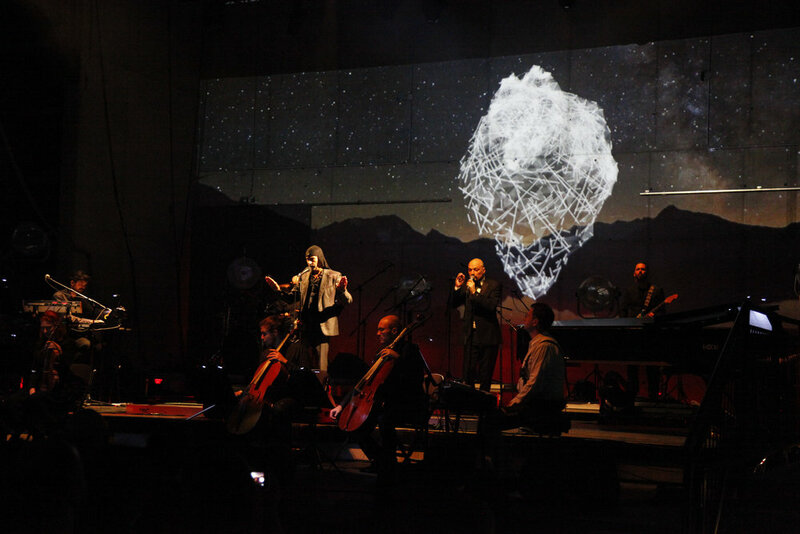 Slovenian band Laibach reinterpreted ‘The Sound of Music’ with acerbic wit and antifascist style, performing at the top of the city’s mountain. The next day an image by Liz Eve featured on the front page of the Austrian standard. The scaffold type figure depicts two hands raised in the air, one holds a star, the other a Kalashnikov. 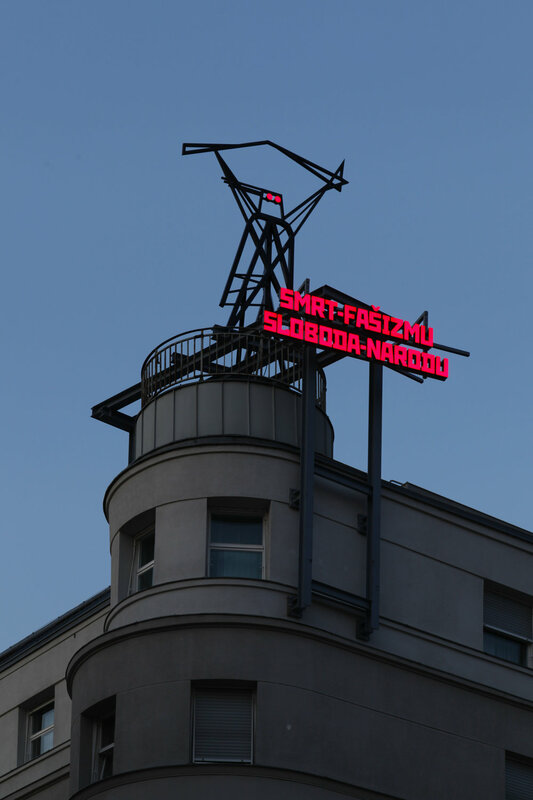 The Yugoslav anti fascist motto and the figures eyes light up red each evening to chase fascists away. An adapted trailer parked at the central bus station becomes a metaphor for the baggage a typical school outing in Graz might carry around. The artists take us on a virtual tour of the monuments of Austria’s modernization. Moscow based artist Irina Korina created an inflatable garden of paradise including slouched indistinct shapes and ‘snow piles’, inflatable tube trees and illuminated signs and pyramids. 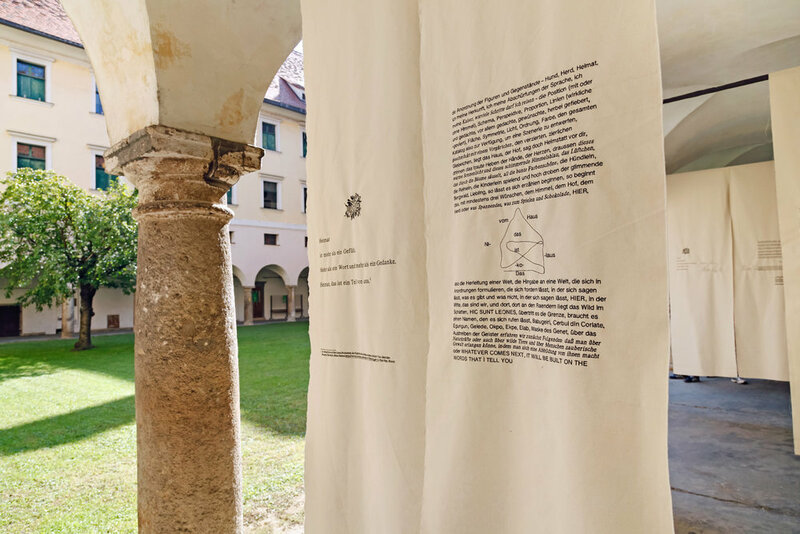 Christoph Szalay created an installation at Kulturzentrum bei Minoriten displaying poetry as an artwork, with words and pictures sewn into hanging fabric pieces. Tony Chakar and his collaborator Nadim Mishlawi’ audio installation inhabits Graz’s iconic Hotel Daniel, built in 1955 as a prototype of a maritime loggia hotel of the kind later spread through South-Eastern Europe in the 1960s, incongruously located on Graz’s busy Europaplatz. It tells the story of a person from the future who travels back to our time in pursuit of a promise made by certain hotels in the mountains of Lebanon, offering a retreat from the noise of the city and a place where people can live in harmony with nature. Chakar and Mishlawi amplify what we have stopped noticing and wonder whether there is a way to unlearn what we have been taught by modernity. Igor and Ivan Buharov took over the Volkshaus Graz and constructed a kind of anarchist laboratory where a revolution of plants could take place. 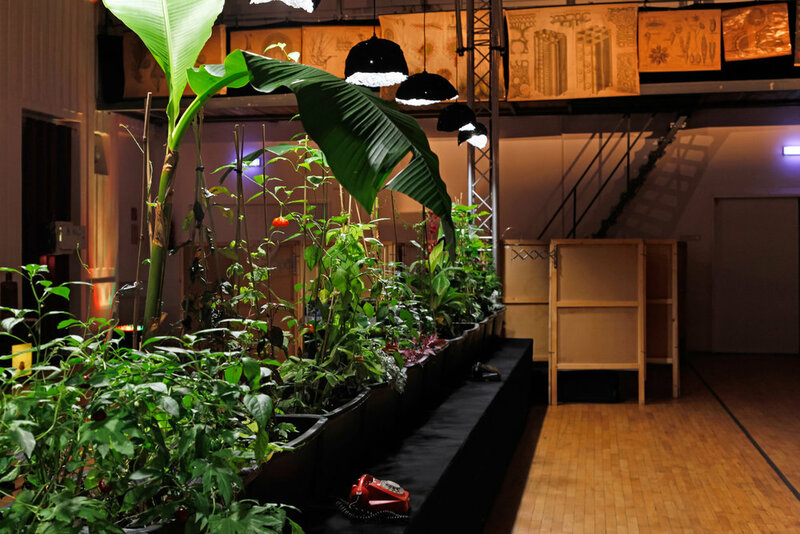 The artists claim that plants have the most widespread and nuanced networks of communication, so that in times of mass surveillance they may well be our best allies in seeking out new allies for secure communication. Artist Roee Rosen with the actress Hani Furstenberg and Igor Krutogolov and his Toy Orchestra presented a theatrical and satirical evening. The Department of Utimology was first established at Dublin’s Trinity College in 2016 to study dead or dying cultural phenomena. Using questionnaires, and encouraged with gingko tea, respondents at Steirischer Herbst were invited to propose an aspect of culture, tradition or ritual to be critically reflected on using Utimology. Arts of the Working Class" is a street journal for poverty, wealth and art. It is published every two months and contains contributions by artists and thinkers from different fields and in different languages. Its terms are based upon the working class, meaning everyone, and it reports everything that belongs to everyone.